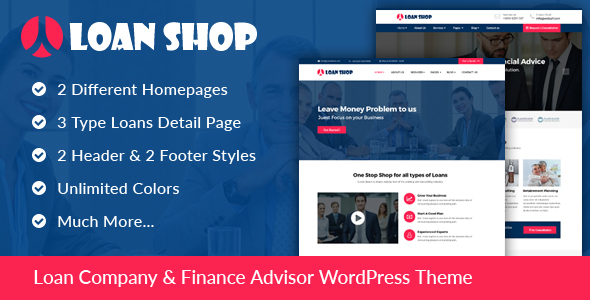 Loanshop – is clean and modern Loan & Finance Advisor WordPress Theme. Developed for loan company, financial advisor, financial and law companies, individual tax / finance advisors, corporate, or any others business company sites. It comes with exciting and impressive features for create your site. Loanshop is designed to create the site with easy steps. It’s responsive, parallax, Loan Calculator, Loan Services, Advisor Services and has great coding for performance and great user experiences. This theme created top on Visual Composer, so you will run your site within few minutes with having basic knowledge of WordPress and Visual Composer plugin. Loanshop is fully responsive and any device can be capable run. Loanshop is designed with unique and multiple use elements which you can easily promote your loan service, credit service, banking service, financial advisor service, etc.